To Be A Professional Makeup Artist, Here Are Necessary Tools You Should Have – As is widely known, makeup artists are now in a great demand. Not only among women, but also men begin to be eagerly interested to pursue their prosperous career as a makeup artist or known as MUA. A makeup artist is usually hired for special events like marriage, film making, fashion show, performance or commercial photoshoot. People use professional makeup artist services rather than doing makeup themselves as they believe that the results will be good. Not like ordinary women doing makeup on regular basis, a makeup artist do a makeup process by which they can earn some money. Anyone who want to be a professional makeup artist should have a skilful makeup artistry and persistent hard work as well as knowledge of what clients need. How to get satisfying makeup results? Besides the required makeup skills, of course, you should also have the needed makeup equipments. Yes, the good quality of makeup tools certainly supports the results of the makeup works. "Makeup tools are very important for makeup artist! If you use a bad quality of makeup tool, then the results will also be definitely bad! Frankly, I only use a reputable brand of all my makeup equipments, because of its guaranteed quality. Once I bought a tool that was cheaper than my usual tool due to a coincidental urgency at that time, one of my makeup tool is lost. And the results disappointed me. Not as good as usual ", said Felicia, a makeup artist who has been around for 4 years in the world of wedding makeup. Felicia who is often called Feli, also reminds for those of you who want to pursue the profession of makeup artist to prepare sufficient budgets, especially for buying your essential work tools. Because, as is known, the necessary tools used by a makeup artist are arguably not cheap. Then, what makeup tools you should own? 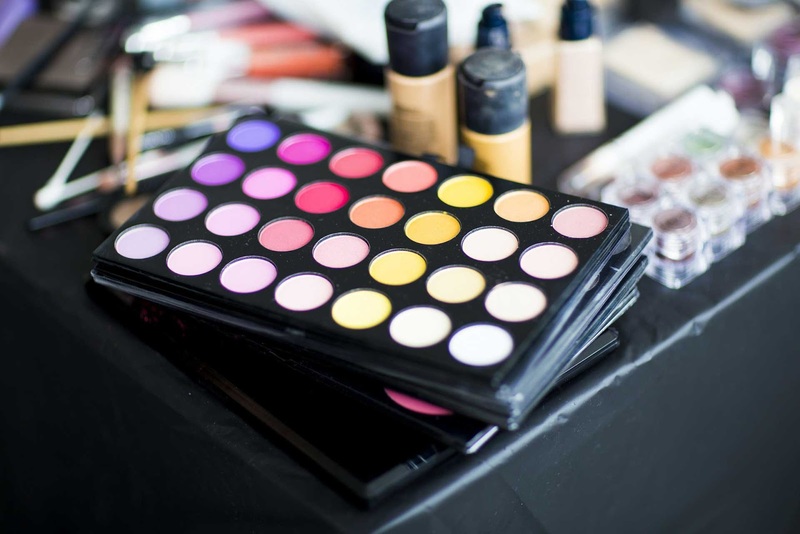 Here are the essential makeup artist equipments along with its usefulness. The basic equipments that must be owned by a makeup artist is brush tools. Brush tools itself have a variety of sizes and different use. A large size brush is usually used to apply foundation, powder, blush on, or finishing powder. While smaller brushes are usually used to apply cosmetics such as eyeshadow, eyeliner, mascara, eyebrows, lipstick etc. It is not recommended to use an all in one brushes because that will damage the brushes. Morover, the results are not optimal as well the hygiene which is also not guaranteed. In addition to apply the foundation by using a brush, makeup artist can also apply the foundation by using sponge or beauty blander. Some makeup artists are also even more dependent by using sponge or beauty blander than using a brush. Besides absorbing excess oil, a sponge or beauty blander is reliable to apply the foundation with more maximum results compared with the brush. Primer and foundation, as if those two basic makeup tools that are inseparable. Primer, has a function to close the pores while the foundation serves to flatten the skin. As a makeup artist, you must learn about the skin color of your client. Not infrequently, you have to mix the colors one with another to produce a matching color to client’s skin color. It is highly recommended that you have a variety of foundation colors to obtain maximum results. Powder has two types. Liquid powder and solid powder. Apply powder after using primer and foundation. Powder is usually used for more matte results or reduce the excess oil levels produced by the foundation. Powder is also useful to produce more long-lasting makeup. In recent years, women have been unable to live without thick, beautiful eyebrows. Every time going out of the house, women seems to not want to go outside without using eyebrow kit. Therefore, the eyebrow kit is an important tool for you to be a makeup artist. It serves to thicken and shape the eyebrows. And, eyebrow kit is very advantageous to produce more natural and intensive makeup results. Makeup artist must have various-colored eyeshadow palletes. With these tools you can create natural to even more dramatic makeup colors. Eyeshadow palletes itself are applied to produce more impressive and vibrant eyelid shapes. The eyes are an important part of the whole face. So no wonder the makeup artist usually spend a lot of time to produce the best eye makeup. One important tool that can not be missed is eyeliner which serves to produce firmer and larger eye look. The eyeliner itself has a various types, namely gel eyeliner, pencil eyeliner, marker eyeliner, and liquid eyeliner. An essential tool that should not be missed if you want to be a makeup artist is a mascara! Every women will want to show the impression of deeper and wider eyes that make them look attractive. To make eyelashes more impressive by lifting or curling them, a makeup artist usually use a mascara which have various types with different functionality of each. Blush on is used to add hues to your face that make it look fresher. Blush on itself has various types ranging from creamy, tint blush, powder, to gel. Pink is a blush on color that is often used by makeup artist. One of required skill that is needed by a makeup artist is how to apply contouring on one's face. Contouring, usually applied in the T-zone area, is very important to produce more gaunt face. While, highlighting, used on the face that you want to highlight, can make the face looks more prominent. Finishing powder is usually used after completely applying other makeup process on the whole face that can make the makeup more durable. You can also add makeup fixer, a kind of mist that is also used to get more flawless results. To get good makeup results, of course, you are familiar with lipsticks to produce perfect makeup. Lipstick itself can also produce a variety of results such as matte, glossy, and butter. Make sure to give a little foundation for the lips to get the desired color. Of course, you as a makeup artist do not want your goods being scattered everywhere is not it? You certainly need a makeup bag to store your makeup equipments. And, do not forget to keep your makeup bag clean to maintain the makeup tools inside.